As part of the Florida Department of Transportation’s (FDOT) drainage improvement project on State Road 207 and State Road 206, detours will be in place to safely complete drainage work on State Road 207 at State Road 206. Safety preparations and work will begin on the southbound side of State Road 207 where traffic will detour to County Road 305 and west on State Road 206 to travel back southbound on State Road 207 from Monday, November 26 at 10 a.m. through Friday, December 7. 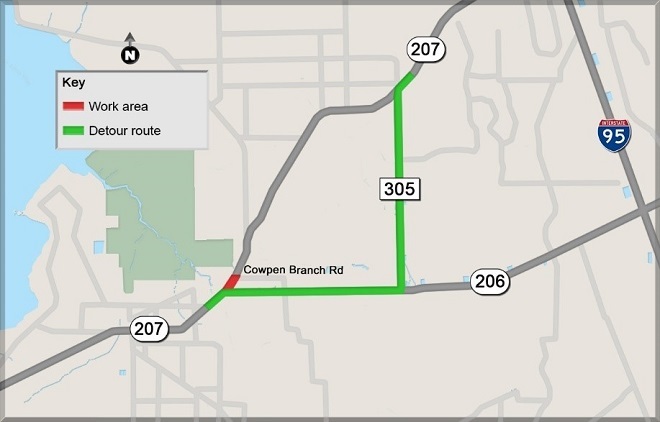 Northbound traffic on State Road 207 will detour east on State Road 206 to County Road 305 to travel back north on State Road Monday, December 10 through Friday, December 13, weather and unforeseen circumstances permitting. Single lane closures will also be necessary on State Road 206 and at State Road 207 to complete paving operations.